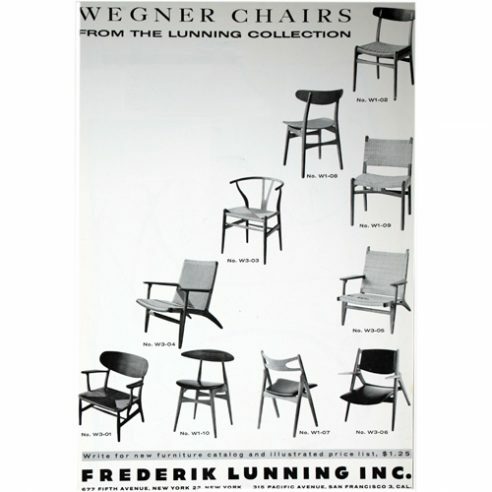 By the late 1950’s “Wegner furniture” was being advertised not just in Denmark but worldwide branded using the designers name rather than those of the individual producers. Wegner commented at the time “If only they would stop that, it’s the furniture that counts, not the name”. However, his designs were by now appearing in the general furniture trade with customers often having to wait up to six months. designed to address this issue being a straight forward constructed with few components in solid timber complimented with a simple two dimensional laminated seat and back. In spite of its simple construction and lightweight appearance the Crescent Chair is nonetheless a very stable and comfortable dining chair. The chair was reintroduced by Carl Hansen & Son in 2012 and is available with either an upholstered or veneered seat. The wood sorts can be mixed to combine e.g. a beech frame with walnut seat and back.